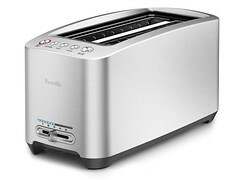 Breville’s motorized Diecast Smart Toaster™ with elegant push button controls. Lift & Look™ activates the motorized carriage to gently raise the bread just long enough to check if it’s done. When toasting is complete but you’d like it little toastier, press A Bit More™ and the carriage lowers again to give it just a bit more time. LEDs count down the toasting progress. Full die-cast construction, automatic raising and lowering, bagel and frozen settings. A. TOAST|CANCEL Button. B. A BIT MORE™ Button. C. BAGEL Button. D. FROZEN Button. E. Motorized LIFT & LOOK™ Button. 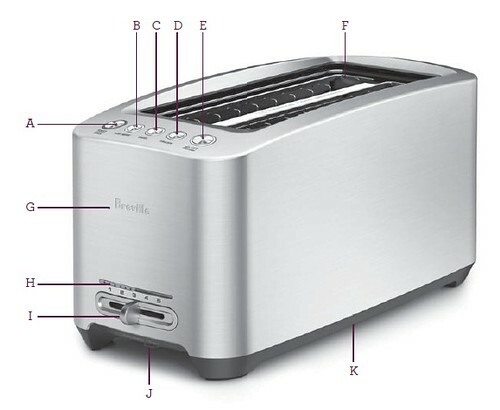 F. Long Toasting Slots. G. Die-Cast Body. H. LED Toasting Progress Indicator. I. Variable Browning Control Slide. J. Slide Out Crumb Tray. K. Concealed Cord Storage. Not Shown: Breville Assist™ Plug.